River is offered the chance to crew on his uncle's trawler - a coastal trip to get a new engine. He finds his cousin Huia annoying - she's all about Maoritanga while he can't even speak the language. 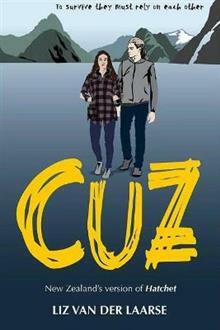 When an accident leaves the two cousins stranded on the coast of Fiordland they must work together to save themselves. Includes information on survival, bush lore, natural remedies, bush tucker and map of the region. Liz van der Laarse is a pre and early teen fiction writer. She has taught in Far North schools as a primary, intermediate and secondary school teacher for over 27 years. Her first book, Trouble Patch (Reed), was released in 2000, and Not Even (Reed, 2002) was placed in the Storylines Notable Book List (2003) in the Junior Fiction category. Liz van der Laarse has also written articles for Wilderness Magazine and for local newspapers.